Nest Update March 9, 2013 - Hatchwatch Begins!! Hatchwatch Begins, MN Bound Eagle Watchers! 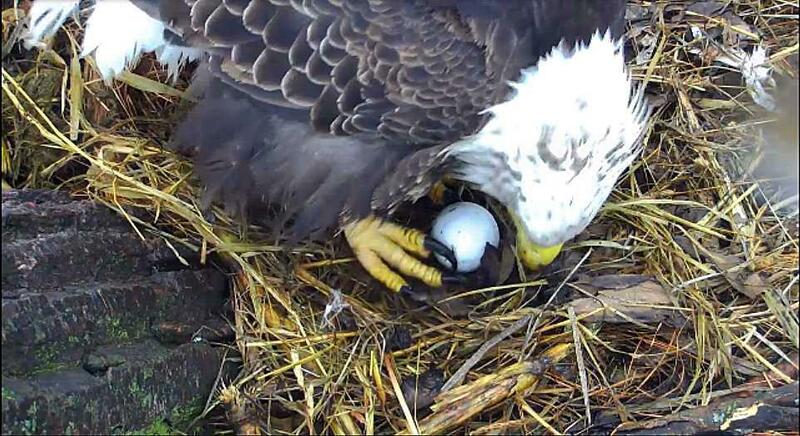 Well, Mom laid the first egg at 3:53pm nest time (CST) today and everybody went wild! The day started rainy and cold with a little work by Mom and Dad to get the nest ready. They were on and off the nest several times in the morning and then disappeared for a while. When they returned Dad brought a small fish which Mom proceeded to nosh right down and she stayed in the nest after. She played with the nest fill for a bit and then looked like she was a little in distress. It was soon recognized that she was in labor and at 3:53pm she gave us a beautiful new egg to watch and worry over. Thanks Mom! it was a very quick delivery and looked like everything went A-OK! A close-up of the egg right after laying. Dad returned to the nest shortly after laying to see what Mom had delivered. He was very happy to see the egg. Mom got off the egg and had a post delivery snack of a partial fish Dad brought. They both trumpeted the news of the egg to the neighborhood. Mom then settled in to begin incubating in earnest. Some chatters were worried that the blood on the egg was a sign of something bad. Anyone who has been through a birth will tell you that there is always at least a little blood. 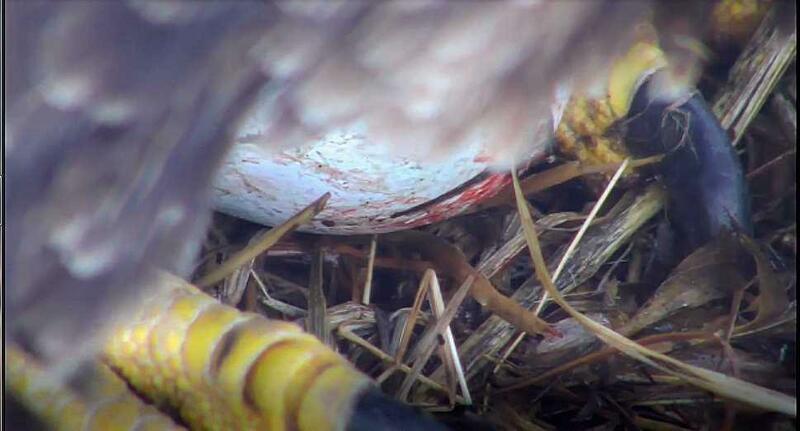 Alls well with the egg and Mom and we look forward to the next egg and a hatching in 35-37 days. All hail Mom for her great job today! And thanks as always to BBC and the cam gnomes for the GREAT pictures!